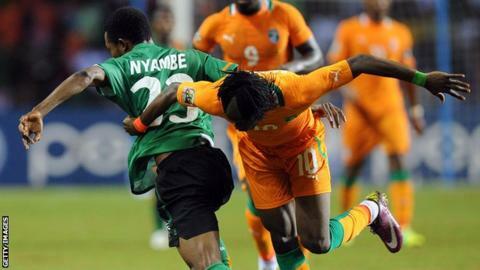 Zambian Nyambe Mulenga will miss the Africa Cup of Nations after breaking his leg in a road accident on Sunday. The defender will be out of action for 12 weeks and will therefore not play a part at the 17 January to 8 February tournament in Equatorial Guinea. Mulenaga was one of three Zambia internationals involved in the crash. Changwe Kalale and Satchmo Chakawa were also among passengers reportedly travelling to Lusaka on a minibus that collided with another vehicle in Kabwe. Mulenga, who plays for Zesco United, Kalale of Power Dynamos and Chakawa from Green Eagles were on board a Zesco United Football Club minibus. The Football Association of Zambia (Faz) said there were fatalities as a result of the crash. "Sources at the accident scene reported that the driver of the Zesco United bus died at the scene, as did three others on the other vehicle," said Faz on its website. Zesco United FC also released details about the condition of the players involved and other club officials who were on their minibus. "Defender Nyambe Mulenga sustained a fractured right leg and is in a stable condition. Changwe Kalale, who got a lift, and Chakao Siachimo, who came for negotiations, are both stable," said Zesco United in a statement. Club accountant Lomuthunzi Mbeba, marketing officer Fusya Bowa, administrative officer Frank Chitambala and committee member Peter Mutale also suffered fractures and are stable. Kalusha Bwalya, President of the Zambia FA, confirmed in a tweet that the Zambia team manager Lusekelo Kamwambi and assistant coach Chintu Kampamba had both gone to the hospital, and that Faz would try to keep supporters updated with the latest news. The players were travelling to Lusaka for a national team camp ahead of next year's Nations Cup. Zambia will be playing in Group B of the Nations Cup alongside DR Congo, Cape Verde and Tunisia.